Pests are the bane of many gardeners’ lives but rather than resort to chemical sprays it’s a much better idea to attract beneficial creatures into your space to feed on the less desirable beasts. 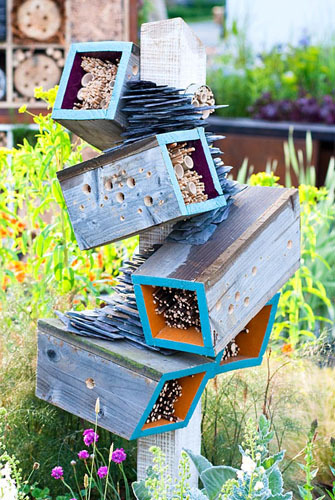 A great way of doing this is to install an insect house – the nooks and crannies within these structures will entice a wide range of pest-eating bugs looking for somewhere to hide or a place to hibernate this autumn. Although you can buy all sorts of off-the-shelf bug boxes from garden centres, it’s really easy to create your own unique design from recycled materials. A series of rectangular boxes mounted at angles on a vertical post results in a sculptural structure that boast the kind of looks that would perfectly suit a contemporary garden. 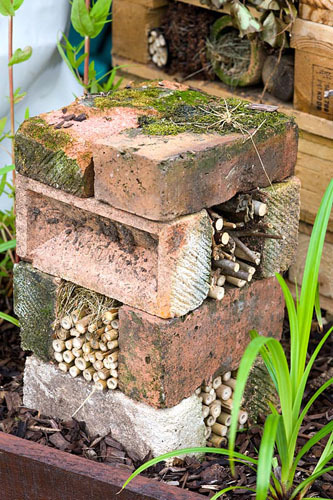 Arranging a few old bricks on top of each other makes a simple insect house within minutes. The voids in each layer can be filled with old stems, twigs and other prunings collected from the garden. Flying insects prefer to hibernate above ground level. 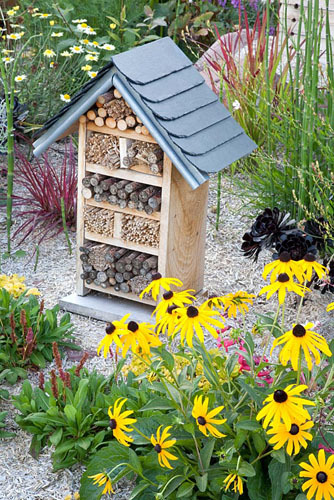 Put boxes in a north facing spot so inhabitants aren’t woken up early in the year, when there are fewer pests around. 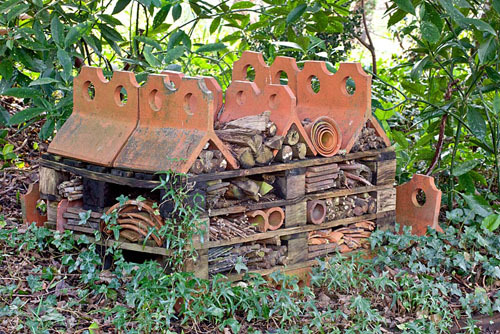 A pile of old wooden pallets makes a substantial insect house to attract a wide range of creatures. Small insects will hide in the upper layers, while large creatures can shelter underneath. 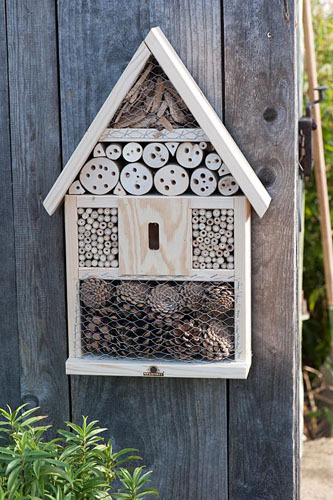 There’s no need to conceal an insect house if possess good looks. Treat it as a garden ornament, placing it within a border surrounded by nectar-rich plants to attract pollinating insects. 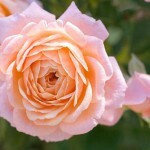 This entry was posted in Practical gardening on August 28, 2014 by gapadmin. A garden isn’t complete without water. Ponds, pools, fountains, rills, spouts and any other kind of water feature will transform a bland space into the ultimate oasis. How? They will add movement, sound and can help transport the eye from one part of the garden to another – as such they can be used as connecting devices for garden ‘rooms’. Larger features will attract wildlife and allow you to grow an exciting range of aquatic plants. 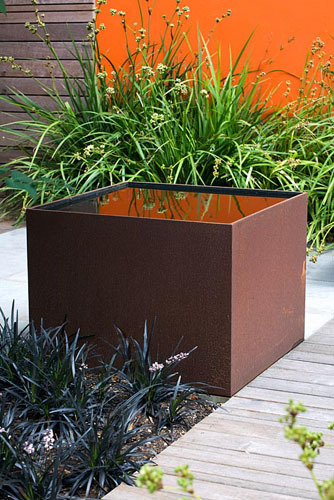 There are lots of different options available to suit every size and style of garden; here are some but for a greater inspiration, take a look at our comprehensive range of images. 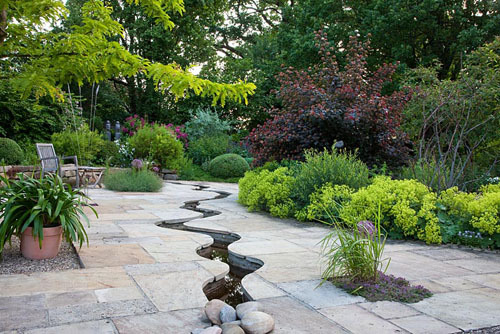 A rill is a classic narrow canal that will physically and visually link different parts of the garden together, and can be used to add interest to an otherwise bland sea of paving slabs. 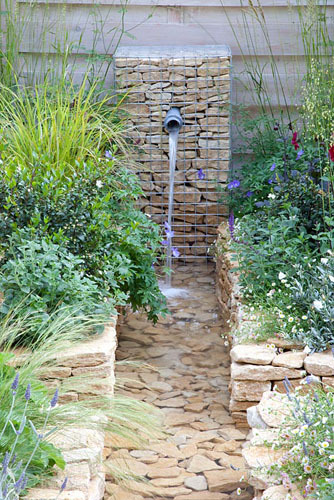 It can be easy to forget about your vertical space, but a wall mounted spout is a stylish water feature that can be adapted to suit any style of garden. The perfectly still body of water inside this metal cube has the reflective qualities of a mirror, and is an elegant way to add water in a contemporary space. 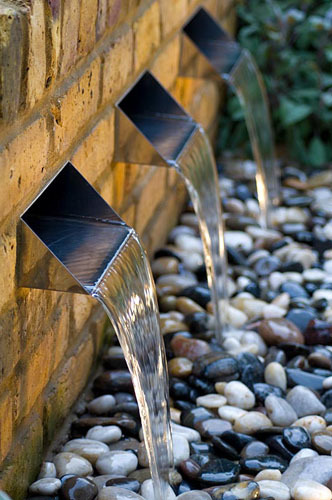 Water gently flows over the edge of these three highly polished metal water spouts into a bed of gleaming pebbles set beneath a low brick wall. Utterly simple, utterly effective. 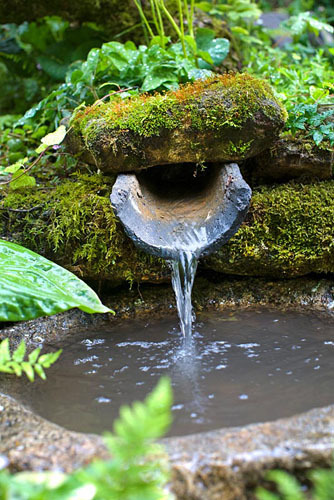 The gentle trickle of slow moving water from a spout into a shallow pool provides a relaxing sound that will help you unwind in the garden after a hard day. This entry was posted in Style notebook on August 25, 2014 by gapadmin. 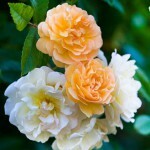 Few plants divide gardeners as roses. To some they embody old-time glamour, while others consider them passé and a martyr to pests and diseases. It wasn’t always like this. 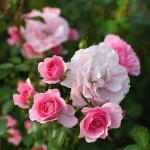 Roses have been grown in this country for centuries and up until the 1970s, few would have taken a swipe at them. 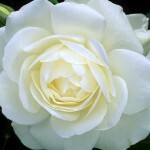 In fact, it was almost impossible to walk along a suburban street and not spot a hybrid tea or two in a front garden. 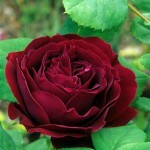 However, an influx of varieties that submitted easily to black spot, aphids and rust, saw their popularity nose dive. 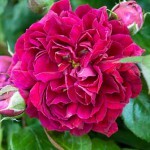 Fortunately, most of the notorious sickly varieties are no longer available, leaving lots of fantastic old roses with heavily scented, blowsy blooms, and modern disease resistant varieties that are equally well worth growing. 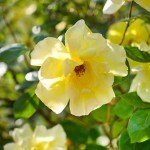 There’s no doubt that they’re now back in vogue and shrub, climbing, rambling roses, along with all the other types are taking their place in gardens once again. 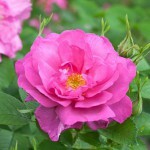 Avoid planting bushes cheek-by-jowl in formal beds. That look belongs in the past. Surround them with flowering perennials or dot them among panicum, calamagrostis, Stipa tenuissima or other ornamental grasses, for a thoroughly contemporary display. 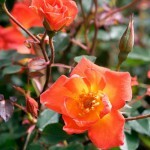 This entry was posted in Plant focus on August 21, 2014 by gapadmin.